InterCity Coachlines is the largest national long distance bus and coach transportation network in New Zealand and has been transporting international visitors and kiwis around New Zealand for more than 30 years. InterCity Coachlines operates buses and coaches services to 600 towns, cities and major skifields within New Zealand with over 150 daily services - 365 days a year. With a range of affordable fares starting from NZ$1.00 and a range of 'Book As You Go' coach and ferry passes to suit all travel budgets, travelling with InterCity Coachlines is an affordable way to explore New Zealand. 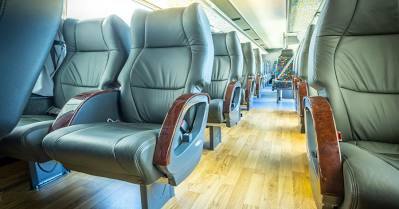 InterCity Coachlines operates a fleet of modern eco-friendly, air-conditioned buses and coaches featuring reclining seats with foot and head rests. InterCity buses and coaches do not have onboard toilet/washroom facilities but InterCity regional and long distance passenger services do stop regularly for comfort and refreshment breaks. All InterCity buses and coaches have seamless 3G/4G mobile Wi-Fi access across all InterCity regional and long distance routes within New Zealand. 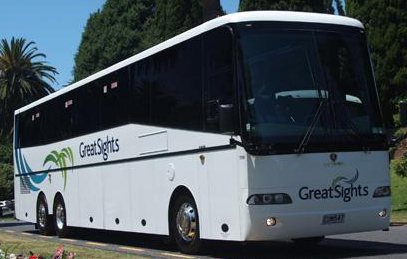 InterCity Coachlines operates the Starlighter overnight coach services between Auckland, Hamilton, Rotorua, Taupo, Palmerston North and Wellington connecting with Cook Strait ferry services operating between Wellington in the North Island and Picton in the South Island. The Starlighter service features onboard toilet/washroom facility, reclining seats with foot and head rests, individual reading lights and air conditioning controls and makes two refreshment/comfort stops on route. For relaxing comfortable travel, InterCity Coachlines GOLD seats - soft leather reclining seats with head and foot rests and individual USB charging ports. GOLD seats are located on the Auckland to Wellington daytime and the Wellington to Palmerston North, Taupo, Rotorua, Hamilton and Auckland Starlighter overnight double decker coach services and the first 3 rows on the single deck Wellington to Taupo, Hamilton and Auckland coach services, the Wellington to Palmerston North, Hastings and Napier coach services, the Christchurch to Kaikoura, Blenheim and Picton, Christchurch to Dunedin and Dunedin to Queenstown coach services. These seats provide plenty of room to stretch your legs. The best thing is, they don't cost a lot more than the regular fare! Some InterCity Coachlines services connect with Cook Strait ferry services at Picton in the South Island and Wellington in the North Island. Also coach services from Nelson, Westport, Fox Glacier, Franz Josef and Hokitika connect at Greymouth for the famous TranzAlpine train the operates between Christchurch and Greymouth and Greymouth and Christchurch. You can book accommodation that is within short walking distance to InterCity Coachlines long distance terminals in Auckland, Paihia, Rotorua, Wellington, Nelson, Christchurch and Queenstown and near Franz Josef and Fox Glacier coach stops. You can make reservations for airport pick up and drop for InterCity Coachlines services for destinations in the North Island and selected destinations in the South Island from Auckland Airport and selected South Island destinations from Christchurch Airport. Great Sights Coachlines operates premier long distance coach service with a fleet of modern, full size eco-friendly touring coaches on major tourists routes connecting Milford Sound with Te Anau and Queenstown and connecting Queenstown with Mt Cook/Aoraki and Christchurch and Queenstown to Wanaka, Haast, Fox Glacier, Franz Josef and Greymouth in the South Island and Auckland, Paihia (Bay of Islands), Waitomo Caves and Rotorua in the North Island that depart daily - ideal for the independent traveler. Great Sights has a range of day excursion sightseeing tours of the Paihia/Bay of Islands from Auckland, Auckland sightseeing tours, Waitomo Caves and Rotorua day excursions in the North Island and Christchurch to Mt Cook/Aoraki and Queenstown, Queenstown and Te Anau to Milford Sound day excursions in the South Island. All Great Sights coaches are fully equipped with air conditioning, reclining seats with foot and head rests, onboard washroom/toilet facilities, video, multi-lingual commentary (Japanese, Mandarin and Spanish on selected tours) and 3G/4G mobile Wi-Fi access. 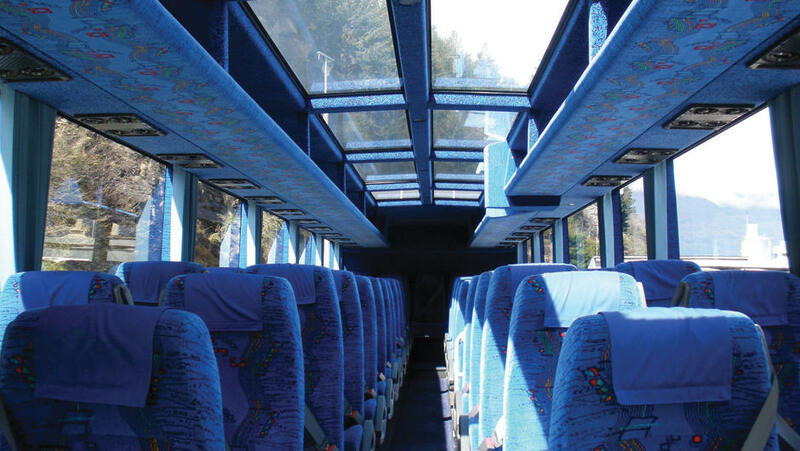 Great Sights Milford Sound coaches feature glass roofs to ensure clear and unrivalled viewing of New Zealand's incredible scenery. You can book accommodation that is within short walking distance to Great Sights coach terminals in Auckland, Paihia, Rotorua, Christchurch and Queenstown. You can also book accommodation near Christchurch Railway Station for the TranzAlpine train services to and from Christchurch. You can make reservations for airport pick up and drop for Great Sights scenic coach and sightseeing services for selected destinations in the South Island from Christchurch Airport.